Northwestern’s Jordan Wilimovsky is expected to swim over eight competitive miles at the Olympics over the next few days. Here’s a breakdown of the rising senior’s races. Wilimovsky qualified for this event by finishing second at the U.S. Trials in July. His 14:49.19 time at trials, a personal best, makes him the sixth fastest swimmer in the world this year. Defending world champion Gregorio Paltrinieri of Italy has the fastest time this year at 14:34.o4. To advance to the final, Wilimovsky will need to swim one of the eight fastest times in the preliminary round. Considering his entry time and current form, he seems to be in a good position to advance. Only seven swimmers have bested 14:53 this year, and only 14:57 was needed to make the final at the most recent world championship and Olympics. Most swimmers do not swim a personal best in the heats, but Wilimovsky appears to have a large-enough cushion on the field to get it done. Wilimovsky will swim in the fifth of six heats, so he will not know exactly how fast he will need to swim to advance as he swims. The first heat will begin at 11:40, so Wilimovsky’s race will likely not begin before 12:45 p.m. The top medal contenders are Paltrinieri, defending Olympic champion and world record-holder Sun Yang of China and Australia’s Mack Horton, who has the second-fastest time in the world this year and won gold in the 400 free in Rio. Wilimovsky is not expected to be a factor in the medal picture. Wilimovsky, who qualified in this event by winning the world championship last year, is the odds-on favorite to win. He decimated the field to win by over 12 seconds last summer in Russia, defeating a field that included defending Olympic champion Ous Mellouli of Tunisia and European champion Ferry Weertman of the Netherlands, who took second behind Wilimovsky. According to the betting markets, Wilimovsky is a slight favorite. Betting website PaddyPower lists Wilimovsky with 7-2 odds to win, while Betfair installed Wilimovsky at 9-2. Both sites have China’s Zu Lijun as the second choice. Because courses are different and conditions are variable, past times are relatively meaningless in this race compared to pool events. The strategy Wilimovsky used to take the world title last year—lurking in the middle of the pack early and building into the lead as the race goes on—is focused more on position than time. Weertman is expected to challenge Wilimovsky; the London Olympic champion Mellouli could as well, though he finished 23rd at the world championships last year. Zu won a last-chance qualifier in June to make the Olympics, finishing four spots ahead of Mellouli. NBC will air the 1500 free, and NBC Sports Network will show the 10k. All races will also stream live on NBCOlympics.com. 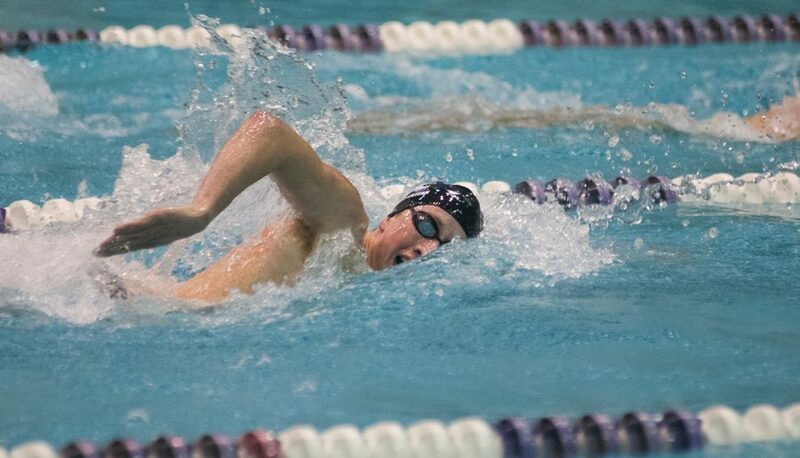 Northwestern swimmer Jordan Wilimovsky finished second in the 1,500 meter freestyle at U.S. Olympic Trials in Omaha, qualifying him for his second event at August’s games in Rio de Janeiro. Wilimovsky, who qualified in the 10 kilometer open water distance by winning the 2015 World Championship in that discipline, finished in a personal-best 14:49.19. He took over control of second place early and established clear water over trailing swimmers by the 900 meter mark. Wilimovsky finished more than 17 seconds ahead of third place finisher Michael McBroom. Connor Jaeger won the race in 14:47.61. A rising senior, Wilimovsky took this past year off from NU to focus on his training. He holds school records in the 500 yard, 1,000 yard and 1,650 yard freestyle. The 1,500 meter event in Rio begins Aug. 12. The open water swim is Aug. 16.